Have you heard of a Jesse Tree? It was new to me when I stumbled upon it at 1+1+1=1. I followed her links to the (free) e-book at Feels Like Home. I was in love! I try to create a handmade ornament with the kids every day during December. What a better way to combine our tradition with the true meaning of the season? If Jesse Trees are new to you too, there is a great description in the e-book. Simply, it's a way of celebrating advent by highlighting a bible story each day starting at creation and leading up to the birth of Christ. Each day's story is then represented by an ornament. Pinky, Chaos and Wild One each have their own mini Christmas tree in their rooms (like these from Walmart). We decided these would be our Jesse trees. We are using the free e-book and Pinky's Beginner Bible for our Jesse Tree adventure. Today we read Genesis and made our first ornament - the Earth and stars. (I decided to do different ornaments for Wild One, I'll get to those in a minute). 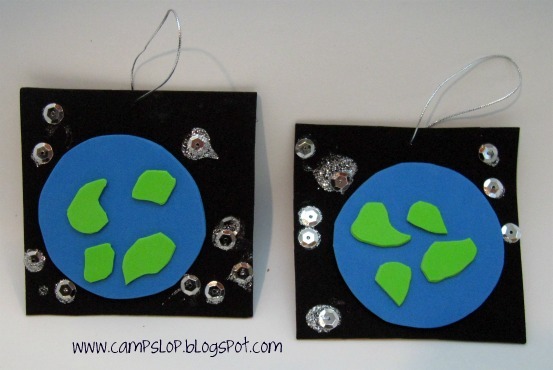 To make these ornaments, we first cut out a square of black foam and glued an Earth on it (don't those continents look exact? ;)). We added stars using glitter glue and silver sequins. To finish we punched a hole in the top and added a ribbon. I think they turned out really cute! I wanted Wild One to be included in this activity, but I wanted to do something that she could be more hands on with (instead of me making the ornament FOR her). I found the idea of printing out coloring sheets (I'm using cardstock) and mounting on scrapbook paper from Christmas Your Way. I'm going to combine the printables on that site with the ones I found here at Catholic Icing. Wild One took an extra long nap today (I'm not complaining!) so she'll start her ornaments tomorrow. Our plan is to do an ornament (or 2) each day. I'll do a post for each of them. I also have some other winter/Christmas fun crafts for this month. I can't wait to share them with you!